Four years ago, Collier read Drusilla Modjeska’s novel The Mountain, which tells the story of how established cultures based on clans struggle to embrace contemporary mores in post-independence PNG. Since Collier was born in PNG, he had a personal interest in the material, and he contacted Modjeska, a stranger at the time. She asked him to join her on an excursion to Tufi, where she revealed she had an indefinable project in dire need of an architect. 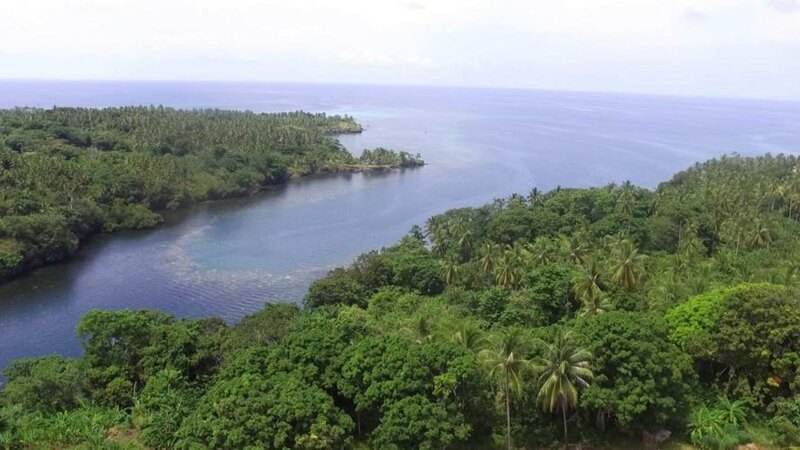 Collier was soon en route; he and Modjeska flew into the tropical coastal fjords of the province of Morobe in a tiny Dash8 plane. Modjeska is the co-founder of Sustain Educate Art Melanesia (SEAM), an organization that works to improve literacy in the six villages of Morobe. 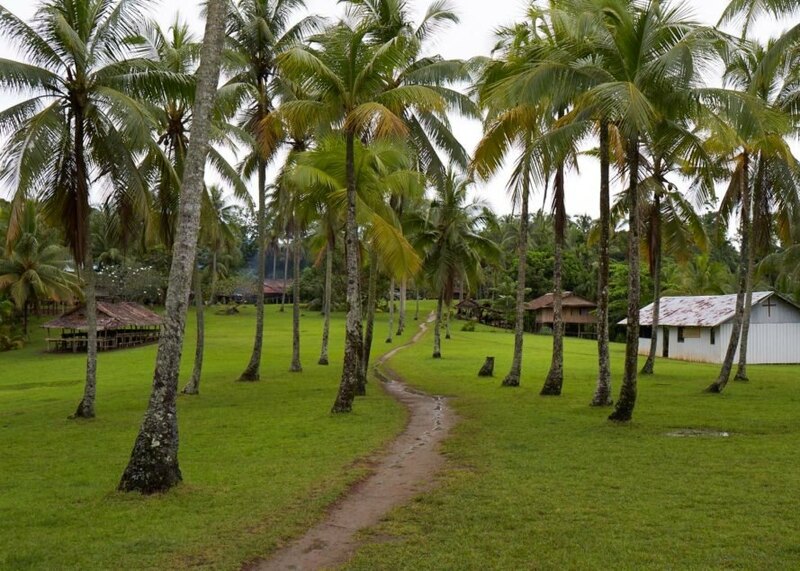 In the more remote areas of PNG, adult literacy is often as low as 15 percent; even though parents want their kids to be educated, they don’t want to sacrifice their customary connection to the farmland that sustains everyone in the villages. In addition, the villages are each very difficult to reach, with many sitting along single-file ridges above the coast, creating a long and treacherous journey for children. 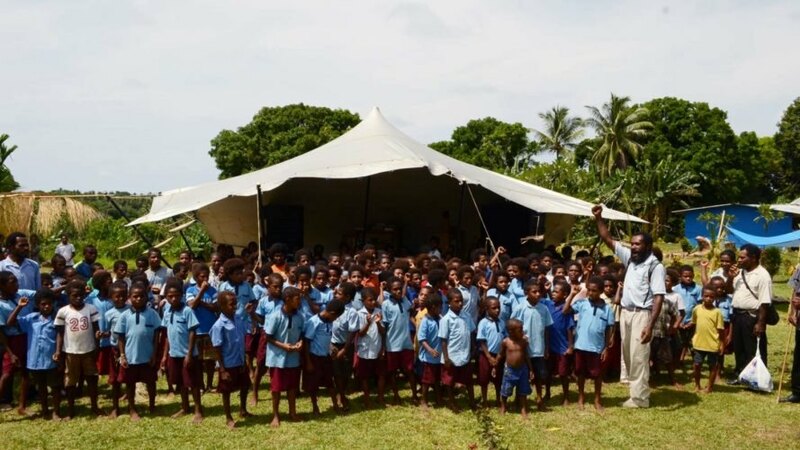 Even though the PNG government funds remote schools, each of which typically supports between 100-150 students of various ages with two teachers, these schools have a minimal number of books (no reference or literary texts, only workbooks) and hardly ever have electricity. Paper is hard to come by, fresh water is rare, and there are no pencils, crayons, pens or other writing materials. Students can’t read to each other, and the schools have nothing written by locals. Collier and Modjeska started brainstorming as soon as their plane touched down and a solid concept for School-in-a-Box began to grow. Early on, it was clear the box had to include water and solar electricity resources and storage systems. The box had to be light enough to easily transport from village to village, large enough to be functional, and tough enough to last and protect its cargo. The boxes, made from polycarbonate, are the same as those used by the US Army to transport armaments. The tents, poles, solar panels, and other materials conform to the box’s dimensions. The stretchable roof covers around 485 square feet and its translucent fabric is easily wound into a miniscule size for storage. Modjeska’s and Collier’s goals for the School-in-a-Box were multifaceted. They wanted the contents of the box to focus not just on childhood education, but also on creative writing and drawing for adult literacy classes, sharing and recording local stories to encourage imaginative investigation instead of pattern/repetitive learning, and making education more accessible to girls. When the assembly is complete, cooling breezes flow freely underneath the structure. The roof is flexible enough to adjust to weather conditions and the sides are adjustable to stave off high winds. Collier created a hefty fabric gutter along one side to accumulate rainwater for storage in a pillow tank. To protect the gutter from direct sunlight, he made it concealable under a raised platform. The local community contributes some of the materials and helps in the platform construction. When closed, the cabinets form a box, although they open up and extend out in five directions. A teacher can conduct a class on one side, private study can take place on another, and the other sides serve as storage compartments. Mundango Abroad, The Readings Foundation, Planet Wheeler Foundation, Victorian Womens’ Trust, the Australian Department of Foreign Affairs and Trade, and numerous other charitable organizations support the project, which has been going strong since its inception in 2014. 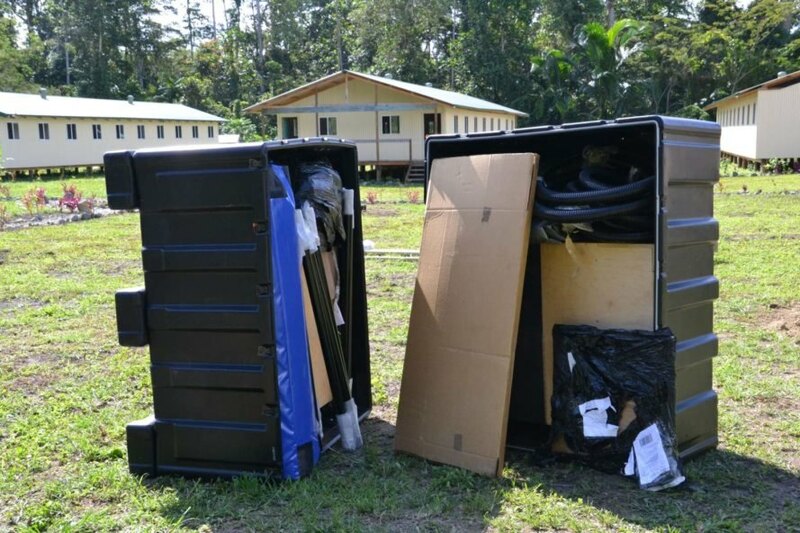 Stephen Collier Architects, which won The Australian Institute of Architects Small Project Architecture prize in 2018 for this project, is investigating how to deliver more boxes to PNG in the future. A new fund to make that happen and take donations has been set up. If you would like to donate or assist in other ways, please email [email protected] with SCHOOL-IN-A-BOX in the subject line. Stephen Collier Architects worked with the non-profit group SEAM to create School-in-a-Box. 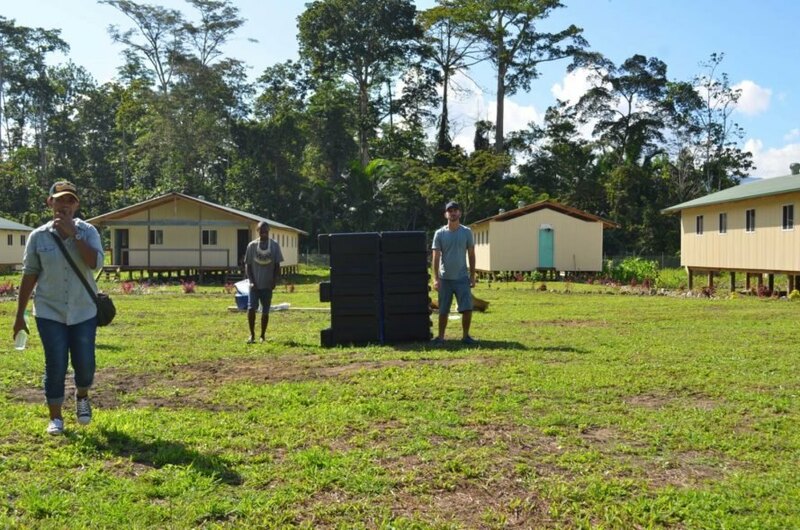 The School-in-a-Box helps bring education to remote villages in Papua New Guinea. The villages' location makes it difficult for the residents to access local schools. 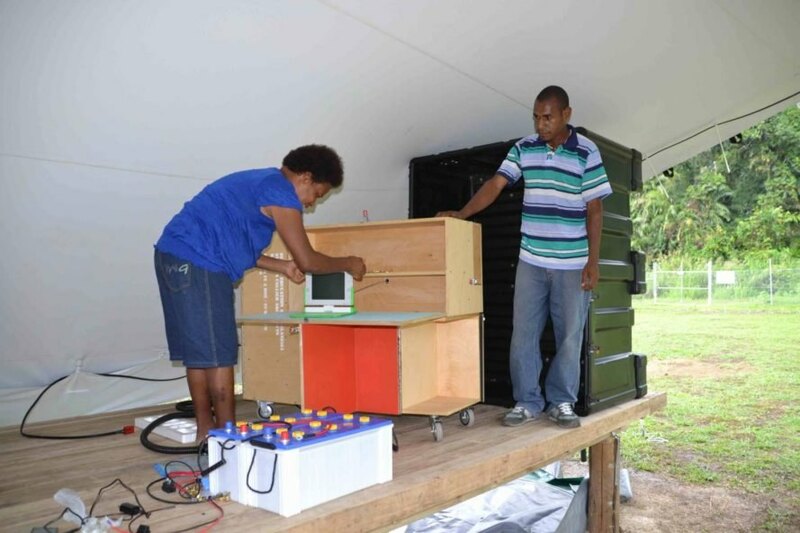 The School-in-a-Box comes in an easily transportable, polycarbonate box. The box contains materials for a tent that shelters the school, solar panels and more. The box's contents make it possible to set the school up anywhere.